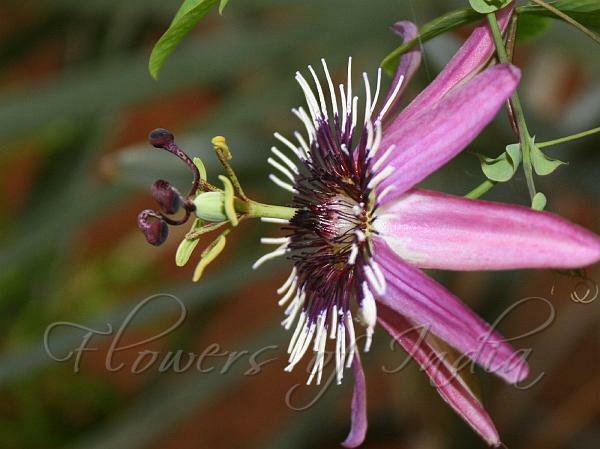 Violet Passion Flower is an old cross of Passiflora caerulea and Passiflora racemosa, that was obtained in 1824 by Loiseleur-Deslongchamps. Several cultivars were selected, with leaves similar to that of P.caerulea, but purple flowers. Foliage is semi-decidious to evergreen, depending on the climate. Leaves have 3 to 5 lobes, are shiny on the upper face, and are deep-green with sometimes red tints. Flowers of P. x violacea have a similar shape and diameter than those of P. caerulea. 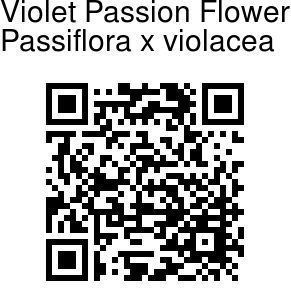 However, flowers are globaly purple, with white and/or black traces. This hybrid was awarded the RHS Award of Garden Merit.